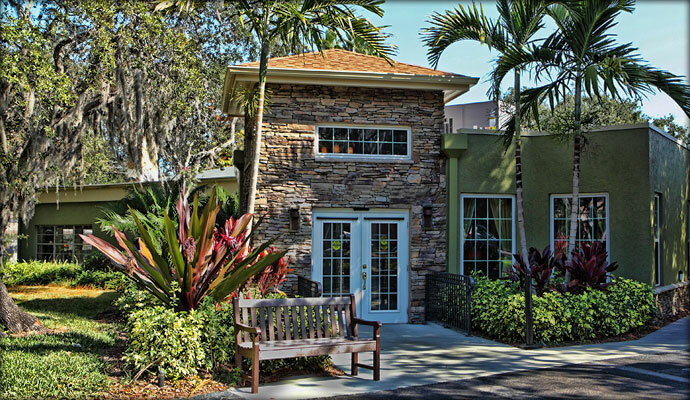 Located near the west coast of Florida’s loveliest beaches, Oak Manor, one of the premier retirement communities in Florida, offers senior living conveniences and care within a setting that establishes a true feeling of home and security for its residents. Every day is a wonderful day when you enjoy the secure & carefree way of life at Oak Manor. From the delicious meals served in our lovely Clubhouse restaurant to the superior amenities that compli ment your lifestyle, the meticulous attention to detail is evident at Oak Manor. Oak Manor Senior Living Community offers senior living conveniences and care within a setting that establishes a true feeling of home and security for its residents. As a full continuum of care community, we offer Independent living, Assisted Living, Rehabilitation and long term care nursing all within our beautifully shaded 16 acres of land. Independence & peace of mind can be yours in a private apartment within our secure environment. An emergency response system, on-site healthcare and other related services make living easy at Oak Manor Senior Living Community. Visit Oak Manor Senior Living Community’s website for more information and to schedule a tour.